Perfectly Located 30A FL Luxury Rental in Rosemary Beach + 4 POOLS to choose From! "At Last" is located near the heart of the exclusive Rosemary Beach. If you take a short stroll from our cottage, you'll find Barrett Square with the Summer Kitchen restaurant, the Sugar Shak Ice Cream Parlor, Wild Olives Market, and La Crema for delicious tapas. If you love to shop, be sure to visit Gigi's children's store, Hissyfits for women's apparel and gifts and many more! Don’t miss the Vivo Salon and Spa for that relaxing treatment you've been longingly waiting for! Just down the street is Shades, a sports bar where you can catch all your favorite sporting events and enjoy the best nachos in town! Rosemary Beach offers four spectacular pools and the heated, enclosed Sky Pool is just a 30-second walk from our cottage! 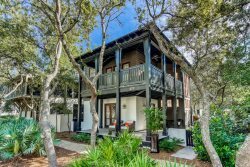 Nestled among this charming town this beautiful 3-story home was designed for your comfort and relaxation with all the style and charm of Rosemary Beach in mind. This home is light, bright and decorated with coastal flair! As you enter the gate you will be greeted by a spacious, enclosed courtyard. The courtyard has seating perfect for guests to enjoy their morning coffee or evening cocktail. The first floor of this home has a comfortable den with seating for 4 and a flat screen TV, a fabulous hangout for the kids. Off this den you have a bunk room with 2 full beds, sleeping 4, a flat screen TV and an attached bathroom. The bathroom has a large, walk-in shower. Down the hall you will find the first king bedroom with attached bathroom. This bedroom is decorated in neutrals to help accent the natural beauty of the surroundings as you look out the windows. The bathroom attached to this bedroom has a vanity with granite countertops and a tiled tub/shower combination. Head up the stairs to the second floor and you will find a powder room off the kitchen. There is also a wet bar and ice maker. The kitchen has beautiful, dark granite countertops to contrast the natural light filling this main living space. This kitchen has high-end appliances to make whipping up any meal a breeze. There is a large bar top off the kitchen with seating for 3 and a seating area with 2 chairs perfect to sit, relax and keep the chef company while they are cooking. Continuing this open concept living space you will find the living room with a large, flat screen Tv and plenty of seating. There is also a dining space with seating for 4. A master suite is located on the 2nd floor as well. The master bedroom boasts a king bed and a private bathroom. Another wonderful feature of this 2nd floor is the large covered balcony with 2 large porch swings. This is the absolute perfect spot to relax with a book, simply enjoy the salt air, or take an afternoon nap after a day at the beach. Take the stairs up to the 3rd floor and you will find another lounging space with flat screen TV, chaise lounge and fun bean bag! This floor also has 2 queen bedrooms and a shared full bathroom with double vanity and tub/shower combination. Below is information about the carriage house at "At Last". This home can be rented in addition to the main house. If you need even more space head outside across the courtyard to the carriage house that sleeps 6. The carriage house has a spacious open concept living space with a sectional and flatscreen TV, dining space with seating for 4 and a well equipped kitchen. There is a queen bedroom with an attached bathroom. The bathroom has a granite vanity and tub/shower combination. Take the spiral staircase up and you will find a sleeping loft with a king bed, and a day bed with trundle. There is a second bathroom off this space with a granite vanity and glass, walk-in shower. This home is the perfect spot for your next vacation with plenty of space for every traveler. The covered porch and beautiful courtyard are an awesome spot to get away to read, people watch, or sip on your favorite beverage as you take in the essence of this home and Rosemary beach. Many memories will be made here …. Come make yours! Stay with Us for a Fabulous Vacation! 3) 5 bikes are included in the rental. To utilize, waiver must be signed and received before code provided. Please contact Saxon Smith with Bikes 4U 30A at 850.399.1230 with any bike questions. We had a great experience. There was a small problem in one of the bathrooms and they sent someone over immediately to take care of it. We loved every minute of it! It is steps from the square and a short bike ride to the beach. Very friendly, easy to communicate with. Smooth process. Loved the house. Ideal location. Very nice and comfortable.